The former home of coal firm the Cory Brothers - a rundown five story Grade II-listed structure in Cardiff Bay - is to be redeveloped into apartments and shops with loans of £6m. 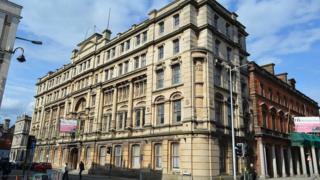 The Corys' building, on the corner of Bute Place and Bute Street, was built in 1898. Housing and Regeneration Minister Rebecca Evans the building was "part of Cardiff Bay's historic past". Most of the cash is being provided by the Development Bank of Wales. The bank, created last October to help small businesses grow, is giving property developers Skyview Estates a £5m loan for the work. Cardiff council will also receive £1m from the Welsh Government's Town Centre Loans fund. Announcing the money, Ms Evans said: "Together we are working to bring derelict sites in towns back into use and support activities that increase footfall on our high streets, tackle empty sites and help businesses grow and prosper." The building was "part of Cardiff Bay's historic past, but I'm looking forward to seeing them revitalised and creating jobs and homes in the near future". Nicola Crocker, from the bank's property team, said the structure, known as Corys' Buildings, was "an iconic and historical landmark".